Picture from simon3 : Cnoc Mordáin view of the Turks. Picture: Cnoc Mordáin view of the Turks. 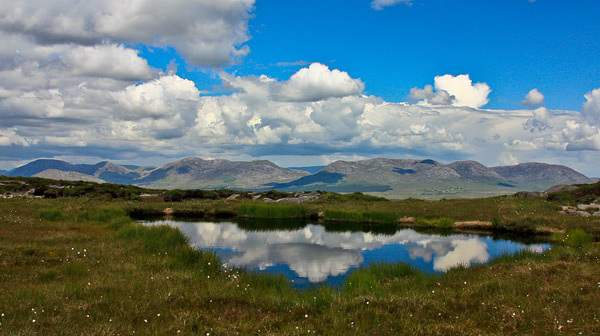 The summit area is a great vantage point for views to the north Connemara mountains on a good day. The picture shows the Maamturks ridge. Usually this is walked from SE to NW, or right to left in this view. Afficionados of the Turks walk will be able to see three of the four main sections that the walk is usually divided into. Centre of the picture is the pass of Maumean with a dark shadow and trees below it. Above this to the right is Binn Mhór. Right skyline is Corgemore. To the left of Maumean the highest ground (and highest point on the Turks) is Binn Idir an da Log. Left skyline and dark is Letterbreckaun. What a view!